The authority of the Orthodox Church is perceived as unshakeable in Georgia. Opinion polls consistently show trust in the church at over 90 percent, a rating politicians can only dream of. The personal popularity of Patriarch Ilia II, who has led the Georgian Orthodox Church since 1977, is particularly high. As a result, it has become a taboo for politicians to criticize the church. In fact, they regularly compete with each other to demonstrate their personal religiosity and close relations to the patriarch. For its part, the church is increasingly trying to play an independent political role. Many church figures view the "liberal West" as an enemy, so they are naturally upset by the pro-Western orientation of President Mikheil Saakashvili. Some clerics have openly encouraged congregations to oppose the authorities. The patriarch himself has been more cautious, but he occasionally makes comments that are viewed as unpleasant by the government. The political opposition sees the church as a potential ally. This bothers the government, although officials have refrained from engaging church figures in public and continue to subsidize the Orthodox Church from the state budget. But it appears this simmering discord is becoming more difficult to contain. A proposed agreement between Georgia and Turkey on the issue of preserving religious monuments in the two countries is becoming an important divisive issue. There are several medieval Christian churches in Turkey that are considered important examples of Georgian culture. If they are not renovated in time, they may be lost forever. In exchange, the Turkish government is seeking the right to restore three mosques and to build a fourth to replace a mosque in Batumi that was destroyed during the Soviet period. A similar agreement was drawn up three years ago, but a last-minute veto from the patriarch scuttled the signing. At that time, the government, frightened by a wave of opposition-led mass demonstrations, didn't dare to go against the church's wishes. In fact, the scrapped agreement was not even discussed in public. A New Mosque In Batumi? According to some sources, the stumbling block was the mosque in Batumi, the capital of the Ajara region. This region has autonomous status, primarily because of its religious identity as the place where many of Georgia’s Muslims live. Since it is now populated by a mix of Christians and Muslims, the topic of building a mosque is sensitive. With the opposition adopting a conservative religious and nationalist stance, the government felt it was best not to touch on this sore point and silently retreated. But now the government is working with Turkey on a new version of the accord. This time around everything is going on in the open. The church has been informed that its opinion will be heard, but it has no right of veto. For its part, the church has already twice, on January 18 and February 4, made statements criticizing a bilateral accord with Turkey and insisting that the church play an active role in negotiations. Government officials politely, but firmly said the church will be consulted at the proper time. Naturally, the opposition has taken up the issue. Ajara's representative in the Republican Party (which claims to be the most liberal in Georgia) came out against the draft agreement, arguing that building a new mosque in Batumi would inflame tensions between Christians and Muslims. 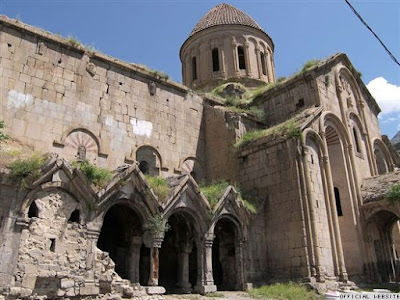 Supporters of the agreement have a powerful argument: opposing it means condemning several classical monuments of Georgian architecture to destruction. They point out that since the last agreement was scotched in 2008, the cupola of one of the churches in Turkey has collapsed. And now the Oshki Cathedral (pictured above) is in perilous condition. Saakashvili has become involved in the debate, albeit indirectly. He has made two public statements criticizing those who manipulate the issue of building mosques in Georgia. He declared bluntly that Muslims living in Georgia, both ethnic Georgians such as Ajara residents and ethnic Azeris, have the right to build mosques. Any other policy would mean banning Muslims from living in Georgia, something that Saakashvili said he would not allow. He criticized "marginal politicians" from the opposition, but it was clear to everyone he was also criticizing far-from-marginal clerical circles. Will the government muster the will to stay the course? It is not only the fate of the four medieval churches at stake, but also the balance of power between the state and the Orthodox Church. In other words, a balance between the secular, civic nationalism of the type represented by Saakashvili's government and an ethno-religious-cultural nationalism increasingly coalescing around the church.